To make the sauce, heat the heavy cream in a saucepan. When it begins to boil, add the melting cheese and stir well. Season with salt and pepper and set aside. Pour salted water in a large pot and bring to a boil, then add the pasta. In the meantime, slice the mushrooms. Set some aside for garnish. Heat a little oil in a frying pan, then fry the sliced mushrooms. Once the pasta is cooked, drain it in a colander. Add the cream sauce to the mushrooms in the frying pan, bring to a boil, then add the pasta. Stir well to combine and serve. 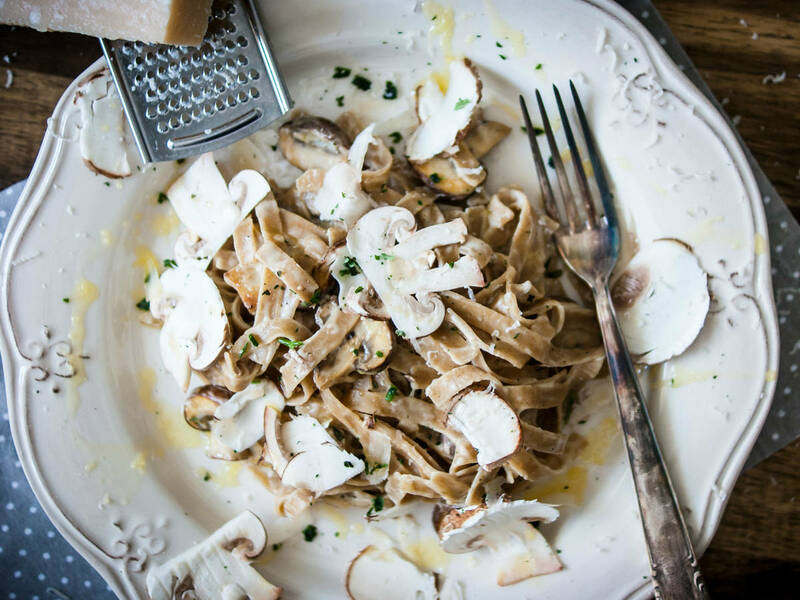 For the perfect taste, drizzle the truffle oil over the pasta and freshly grate some Parmesan cheese on top. Finally, add the mushrooms you set aside earlier. Now enjoy the finest dinner!